I spent the month of February at the marina where I began my life as a LiveAboard. I was dog and boat sitting for friends on vacation. It was nice to catch up with folks I haven’t seen for a while, but I can’t say I miss the old slip. I take this as confirmation that I am doing right by changing up marinas every other year. All four marinas I have lived in so far have had different flavors and quirks. I can’t work out what exactly makes them different until I leave and can look back from a distance. There is a tension in some of the marinas that I believe stems from two vastly different real estate users living elbow to elbow. You can call them Haves and Have Nots, or Landlubbers and LiveAboards. It’s not about class structure, but money and values do have a part. There is a distinct hierarchy from Sailboats to Motorboats to Boxes on Barges to RVs. The folks in the condos overlooking the marina either envy the boaters or think they’re nuts. I find I am not comfortable with the confrontation of high contrast ideals in opposition at close quarters. As a continuation of my social anthropology studies I decided to Go Native here on the Peninsula for a day and was a makeup model for a girl trying to get a job at a spa at the Stanford Mall. The girl should have quit before she started. She had no idea what Palo Alto upper crust want to look like, particularly a “mature” woman such as myself (aka “old”). I knew it was going to be a disaster when she started putting prosthetic eyelashes on me. It was pretty gross, made me look cross-eyed, hurt, and my whole face felt sticky after the TWO HOURS which she had said would be 20 minutes. To add insult to injury, she bolted without graciously transacting the “negotiable compensation” we had discussed. Not only was I transformed into a trollop, but scammed by a Craigslister. Mostly I feel sorry for women who feel like they have to put on this elaborate mask before they can leave the house. It’s hard work to be beautiful. I think I’m just too lazy for that lifestyle. I’ll go back to my sailboat, thank you. I have enjoyed the good reception I can get on my cell phone in this “metropolis” and hot and cold running water and wifi. It’s easy to spend too much time on the computer when anticipating returning to spotty internet and dropped calls. The price for living in the boonies. 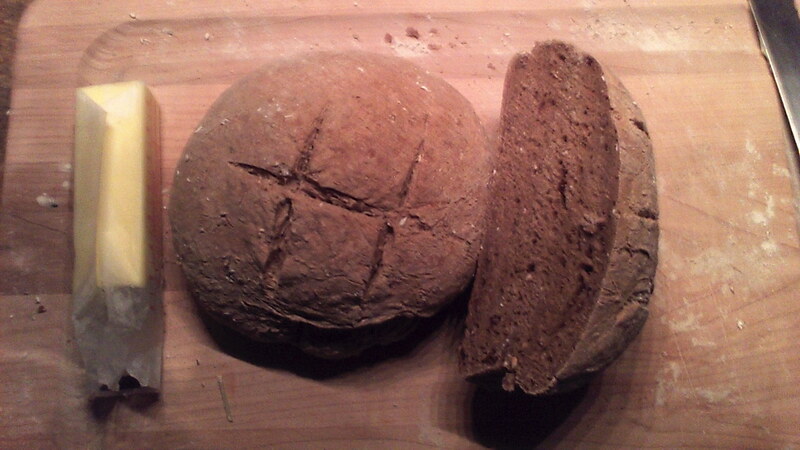 The bread I made in the mysterious convection oven contraption was edible and frugal. The extra space in the galley inspired me to make more complex meals than I normally attempt in my 2′ x 2′ foodery at home. Click here and here to get complete info about how to order your cards and/or pre-order a signed, numbered first edition of the The LiveAboard Volume I Issue I Dock Dorks docucomic. This entry was posted on Thursday, March 1st, 2012 at 11:03 pm and is filed under Firsts and Trips. You can feed this entry. You can leave a response, or trackback from your own site. I just discovered this site. Wow. Cool! A nice way to see what you are doing and up to. I’ll look into the cards as soon as I can. Sounds like a good way to go. I blew my back out last Saturday. This Saturday, I actually feel like a human being. Although, I’m still not able to walk very far. It was a pretty serious injury. You say you’ve been in 4 marinas? Redwood City, Berkeley, Delta (somewhere? ), and the other one is? I do admire your gypsy spirit. I haven’t been very active in the y.c. I will eventually find my way here. I had quite a few other things going on, however. That’s about it. I’ll check and see that you picked this up. For some reason, the Marina wifi is actually working better now. Sitting aboard Banana Wind right now. Hey Tom, I count the Redwood City Landing as a different marina from Pete’s since they are owned and run by different entities and feel very different. Hope you feel better soon. Sounds ouchy. All best to Rufus from Austin.